It is not every day that an album cover reminds me of hiking in the mountains and seeing that tell-tale sign come over the top announcing an x number of minutes before rain comes pouring down and thunder clapping your ears. Time to run for cover. Not the music on Gloria Duplex. Henri Jamison presents himself as a modern singer-songwriter who is able to incorporate modern influences into his at heart a-man-with-a-guitar kind of music. As such Gloria Duplex calmly goes about its way. Part Conor Oberst/Bright Eyes, part 'Bright Eyes' the hit, as in Art Garfunkel's high voice, part Damien Rice and probably scores of other singer-songwriters, but these three are the main references you need. As such an artist needs to distinguish himself from the score of many. Does Henri Jamison manage this feat? On average the answer is yes. 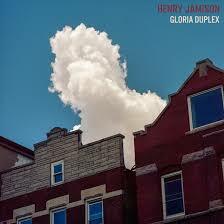 Enough happens on Gloria Duplex to make it a listening experience. The way the songs are arranged give them an mysterious aura. This starts with the indirect way of singing of Jamison. His voice softly floats over the songs, giving them a dreamy atmosphere. Underneath the acoustic guitar and piano there are undercurrents giving the songs their mystery. Sounds that are not so much describable. Hovering in the background. There are keyboards involved for sure, but also samples of voices and sounds that do not so much contribute to the melody or harmonies. They seem simply present to make up a part of the whole just by being there, while totally belonging. It would simply not be as intriguing without them. Like he sings in 'Ether Garden': "That's when I finally heard those voices, singing oh oh oh". it works the same for these sounds. They are there but I need to really listen to hear what is presented in the background of this album. Henri Jamison is from Burlington, Vermont and releases his second full length album after 'The Wilds' (2017). On his new album he manages to capture a mix between classic singer-songwriting and more modern influences. Jamison takes that to a level I haven't heard since Damien Rice's second album. And then comes in the mysteries as described above. It is this combination that makes Gloria Duplex special. It is not the bare essence of the songs. Most are good and even better, but that is not what makes the album stand out. Just listen to 'In March', a voice and acoustic guitar. There are thousands and thousands of aspiring singer-songwriters who can do that. It is about what happens on the rest of the album. Then listen to 'Reading Days', the song before last. The mysterious piano notes that meander through the song as if they do not belong, yet do. It is here also that Damien Rice really comes to mind. There's simply no denying his influence. With his soft, modest voice Henri Jamison delivers his tales and stories. Whether personal or made up, they are interesting to listen to. So, as a warning, do not come to Gloria Duplex if you're in the mood to party, but certainly do put the album on when you want to listen to singer-songwriter songs and dive into that mysterious mood that is all over the album. This album has so much to give, share and discover.